randymajors.com: A couple of enhancements to the Historical U.S. County Boundary Maps tool -- and a thank you! I've recently made a couple of enhancements to the Historical U.S. County Boundary Maps tool that make it easier to read and see the results of the search (see screenshot below). Thank you, The Family Nexus, for your article that had very nice things to say about the tool, and also made me aware that the text was a tad small. Another enhancement is the addition of a little "maximize" button above the "Go!" button that expands the map window for much easier viewing (see the little square in the top right of the above screenshot). 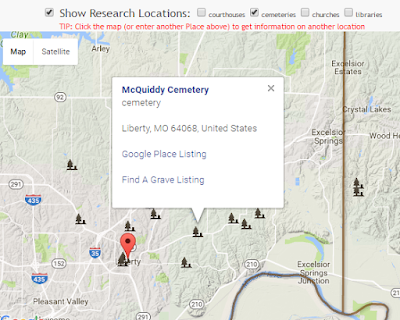 Finally, one last enhancement is the option just above the map for "Show Research Locations" that shows you the courthouses, cemeteries, churches and libraries on the map -- all places for potential ancestry research in your area of interest. (Note: use this option once you're zoomed in pretty tight on an area, as it won't do much good if you're looking at the whole nation or even a state.) Once you've checked the box and the icons have displayed on the map, you can click each icon on the map to see the name, address, and website of each library, courthouse, or church. And in the case of cemeteries, there's also a link directly to its Find A Grave listing. Finally, I want to give a heartfelt (if belated) thank you to Family Tree Magazine for the great honor of highlighting my Historical Maps and AncestorSearch tools in your ranking of the Top 101 Best Websites for Genealogy in 2016! 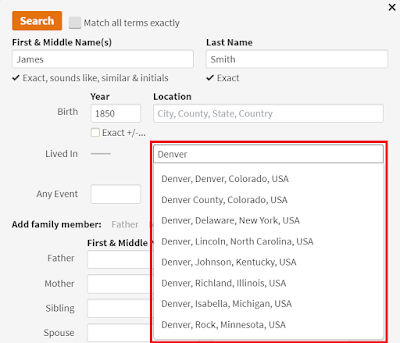 From their Best Tech Tools for Genealogy in 2016 article, "This lively blog stands out for a pair of cool tools: One makes it easy to compare past and present locations in the Atlas of Historical County Boundaries; the other builds a better, genealogy-specific Google search using terms you fill into blanks." As always, comments and ideas on how to further improve the tools are welcome.